Y’all, these Oatmeal Raisin Cookie Overnight Dessert Oats. I’m speechless. It really does taste like a crumbled oatmeal raisin cookie dunked in milk. It’s so decadent and sweet and sinful tasting, I feel like it shouldn’t even be in the “breakfast” category. But, then I remember what it’s made of: 100% healthy, wholesome, natural ingredients! So duh, of course it’s breakfast-worthy. If I’ll be honest, no joke, every night for the last two weeks I’ve made a bowl of these Oatmeal Raisin Cookie Overnight Dessert Oats. It’s seriously the best because breakfast is all ready and done come morning time. You’ll always wake up in a good mood because you know what’s waiting for ya in the fridge — a big bowl of sweet, sweet, cookie-flavored oats. I usually jump off my bed and run to the kitchen. When I open the door it’s like there’s a choir of angels. Like life is too good to be true. I mean, it’s dessert… for breakfast! 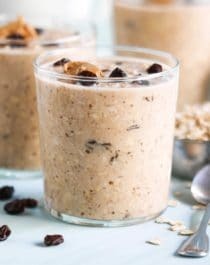 This healthy Oatmeal Raisin Cookie Overnight Dessert Oats recipe is sweet, delicious, and easy to make. You'd never know it's sugar free and dairy free! In a large bowl, whisk together just a splash of the almond milk with the almond butter and vanilla extract. When it’s perfectly smooth, whisk in the remaining almond milk. Stir in the oats, ground flaxseed, stevia packets, cinnamon, and salt. Once combined, stir in the raisins. **If you want to stay fuller for longer (and enjoy thicker oats), add a scoop of vanilla protein powder along with a little splash of extra milk. The first time I tried overnight oats was in college. I was desperate to find a breakfast that would keep me full all throughout my 4-hour Bio lab. I wanted to make microwave oatmeal (as I didn’t own a pot or saucepan) but my dorm’s kitchen was a mess. Like, Panda Express had exploded all over the microwave and no one cleaned it up. NOODLES EVERYWHERE. Sooooo overnight oats it is! It took a lot of trial and error to make a bowl that didn’t look like barf and taste like sand. A LOT. But I’m happy to report that I finally perfected the best overnight oats ever. Oatmeal Raisin Cookie Overnight Oats, to be exact! Have you ever made overnight oats before? Or do you prefer stovetop-cooked oats? 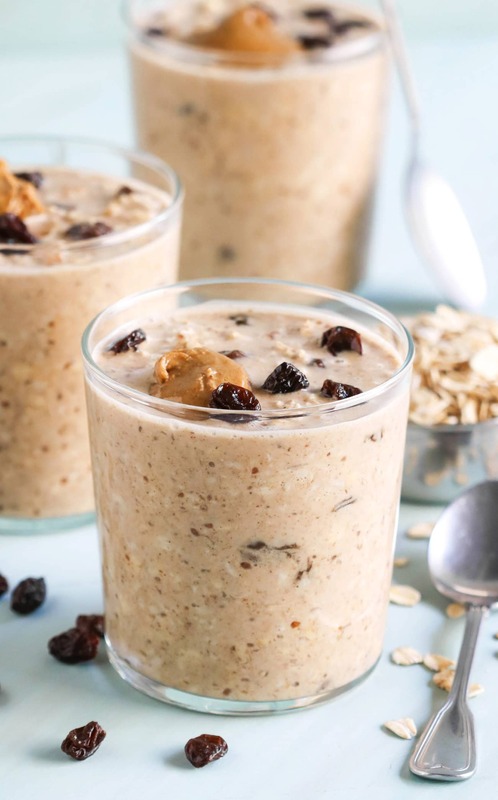 Whatever you prefer, you gotta give these Oatmeal Raisin Cookie Overnight Dessert Oats a try! This looks so good! I can’t wait to try!!! After reading your post last night, I knew I had to try this! Off to the kitchen I went…I had everything except oatmeal and almond butter but I replaced these with oat bran and sunflower butter. I used two packs of Stevia (a little too sweet for me) but it was super yum…just like you said…not that I doubted, but I did want to be convinced, ;P Thanks, this one is a keeper! Oh my goodness, I have been making this for breakfast the last couple days and don’t plan on stopping for a while! This is very yummy! DEFINITELY making this tonight to have tomorrow! Can’t wait! I made overnight oats for the first time using sunflower seeds and dried cranberries, and have been craving an oatmeal raisin cookie version ever since! Thanks Jessica! I’m mixing this up again right now! I just recently found your blog and I love it! 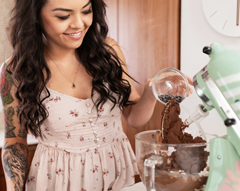 You use healthy ingredients to make delicious desserts perfect! I tried this oatmeal OMG I thought it was having dessert this morning! I might have to actually make this for dessert one day!! Thanks for all the amazing recipes. I have a question: How do you create recipes/experiment? In terms of making a recipe such as a healthier pie how do you begin experimenting and replacing ingredients? 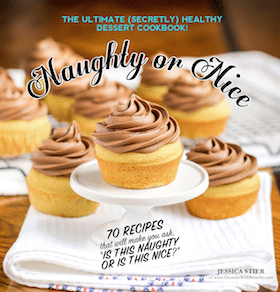 I really want to make my own much healthier dessert recipes but I’m not sure where to begin. Any tips? Thanks so much! Please keep creating amazing recipes! Awww thanks so much Rachel 😀 I’m so glad you like the blog AND the oatmeal!! Food is on my mind about 23 hours a day, I even dream about it, so recipes are pretty easy to think of for me. Also, I have a never ending list of recipes to try in my bookmarks, Pinterest and FoodGawker favorites. I also follow a billion other bloggers who post AMAZING recipes every day. Inspiration will always be on those websites. -Replace white sugar and corn syrup with date sugar, coconut sugar, pure maple sugar, sucanat, erythritol, stevia extract, honey, pure maple syrup, and organic agave nectar. -Use whole grain flours like oat flour, brown rice flour, sorghum flour, whole wheat pastry flour, quinoa flour, buckwheat flour, almond flour, coconut flour, etc. Oh my goodness.. This was so good! I will definitely be making it again for breakfast soon 🙂 perhaps I’ll make it again tonight lol. Um…Yum!!! Made this last night and LOVED it! Thanks for helping me switch things up! Passed it on to my coworkers this morning! 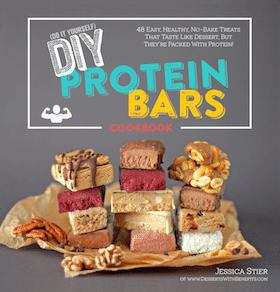 Jess……can the whey protein be subbed with the brown rice and still turn out ok? I haven’t used the protein powders enough to know.